Come bird with us!! 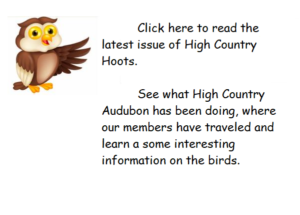 A major focus of High Country Audubon Society is providing enjoyable and educational birding opportunities. Birding is a wonderful way not only to identify more birds but also to meet people in the area who enjoy birding as well. HCAS also provides learning opportunities about nature in general and how bird populations are affected by all other aspects of the natural world. Visit the links below to learn about HCAS’s numerous scheduled bird walks and our local and regional field trips. We are working on an interactive birding hotspot map for our website so stay tuned. If you’re new to our area or just want to review where great birding spots are located in the High Country, visit our map.